Harlow is a town that sits just inside the Essex side of the Essex-Hertfordshire boundary. It exists in its modern day form as a 'new town' which was built to ease the overcrowding in London due to the devastation caused by severe bombing during World War 2. The original village of Harlow was mentioned in the Domesday book, but since the formation of the 'new town' this area has been renamed Old Harlow and is now one of the eleven wards of Harlow. 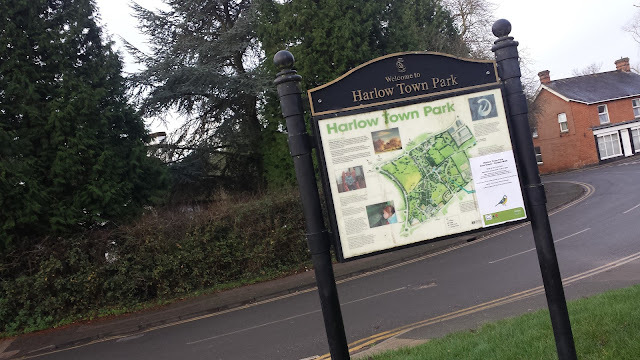 Near the northern border of the 'new town' lies the 164 acre Harlow Town Park; an area that was envisioned as a 'large village green' and area of open space within walking distance from local homes and transport. 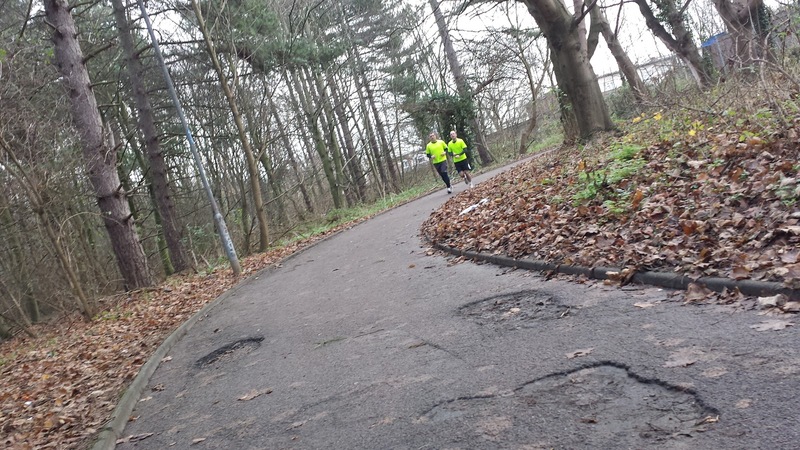 Harlow Council received a grant of £1.83m from the Heritage Lottery Fund and the Big Lottery Fund as part of a £2.8m restoration plan for the park. Much of the restoration work is either under way or has been completed. The money has gone towards many improvements including the refurbishment of 'Pet's Corner' which is a small farm that is open to the public (free), restoration of the park's water gardens, improvements and upgrades to the bandstand, restoration of the gardens and wooded areas, and conversion of Spurriers House (a historic house dating back to the 1860s) into a cafe. 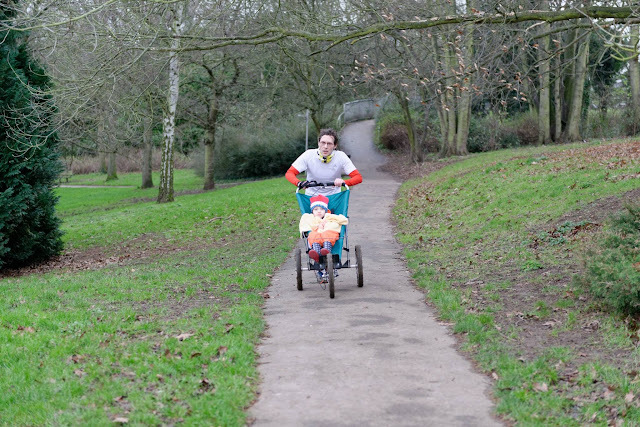 Of course, we were here for the parkrun. 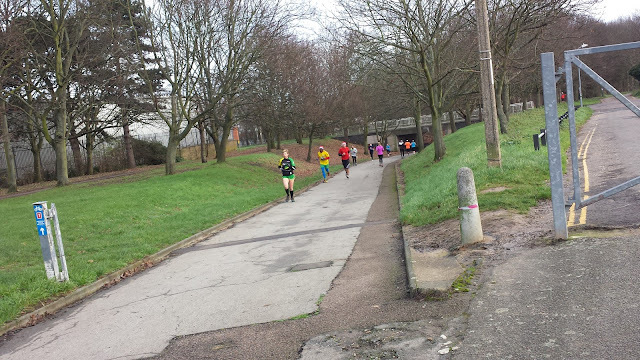 Harlow parkrun sprang into life on 8 November 2014 and, at the time of writing, attracts around 100 runners per week (104.9 to be precise). It takes place on a mix of tarmac paths and grass over two large laps plus one shorter lap. 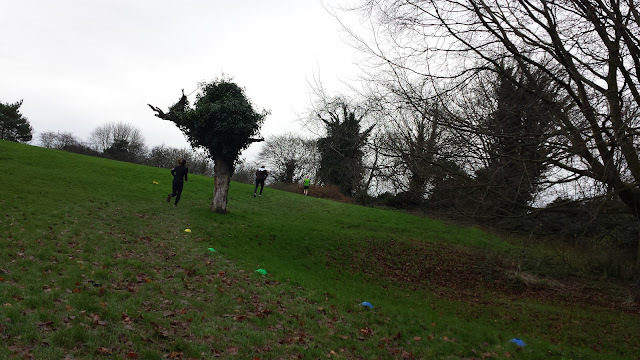 The course feels largely flat but there are some undulations in the mix. In the summer, road shoes would be fine, but we visited on Christmas Day 2015 and the grass was a little muddy, so in the winter you might find a very light trail shoe handy for this course. Travelling to the venue was fairly simple, although if you drive and are not familiar with the town you might want to flick the sat-nav on as the main roads all look very similar and seem to feature a gazillion roundabouts. The car park is is next to the Greyhound pub and the 1914-18 War Memorial just off School Lane. 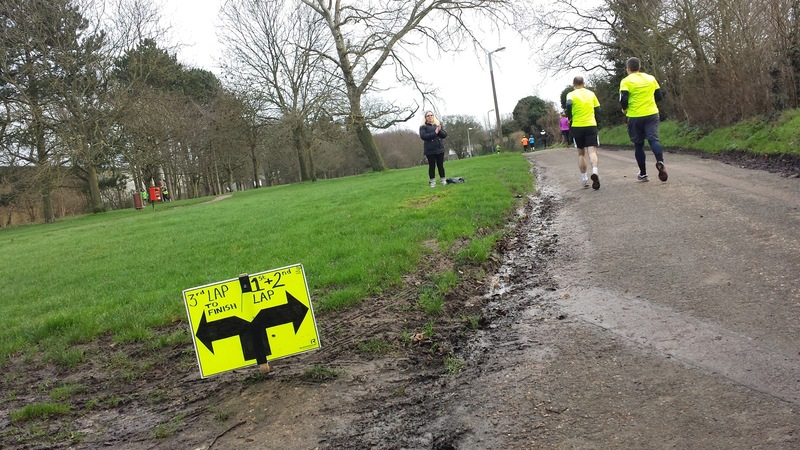 On the official parkrun page they refer to it as the Greyhound car park, but the Harlow Council page refers to it as the 'School Lane car park' and the sign at the car park advertises it as the 'Town Park Pay and Display Car Park'. On a Saturday, car parking is free for up to two hours. Christmas Day fell on a Friday so the mid-week parking charges were in operation when I was there which means the free parking was only for a maximum of one hour. With this in mind I paid the £1.10 fee which covered me for up to 5 hours of parking. There are some toilets adjacent to the car park but they were closed and I think this is permanent. The closest toilets are situated at Pet's Corner which is approximately 3 minutes walk away from the car park. Cyclists seem to have a fairly comprehensive network on segregated and shared use paths throughout the town so cycling should be a decent option for anyone local. I didn't spot any cycle racks around the car park or start area, but I'm sure there are some options for securing a bike if need by; there's always somewhere. If travelling by train then Harlow Town Train station is the place to head for. It is located just to the north of the park and is around 10 minutes walk from the start line. The new runner briefing was incredibly detailed and included a complete breakdown of the course with all of the important points covered clearly - very impressed. The run itself starts on the main, shared-use path that runs along the eastern side of the car park. From the start, the course heads uphill as it curves around to the right and the runners continue to follow this path right the way along until it reaches the main road (Howard Way) where the course dips down to take the runners underneath the road and, from what I can make out, out of the park. 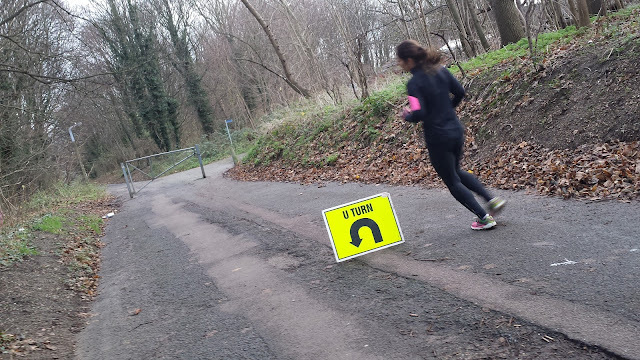 A zig-zag incline takes the runners back up to road level where there the course now takes the form of a private road. At the end, the runners reach a cone where a 180 degree turn sees them heading back in the direction they came from. The runners fork off to the right to take a more direct downhill route back to the underpass where they return to the park. 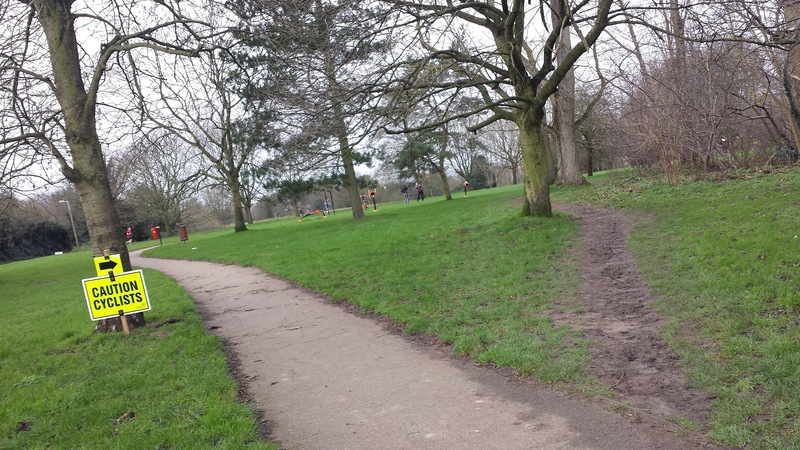 This part of the lap takes place largely (but not exclusively) on grass and takes runners over to the northern side of the park where the more challenging of the undulations are found. 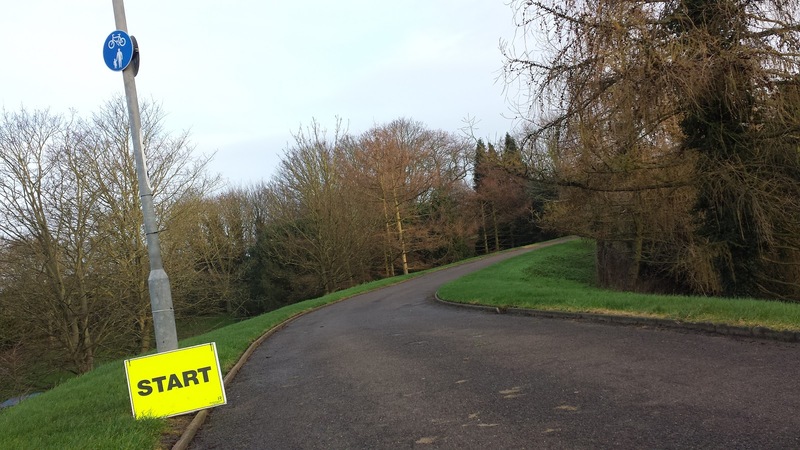 For info, there is currently a minor discrepancy between the course we ran and the route shown on the official course page but as it is all well sign-posted I wouldn't worry about this. 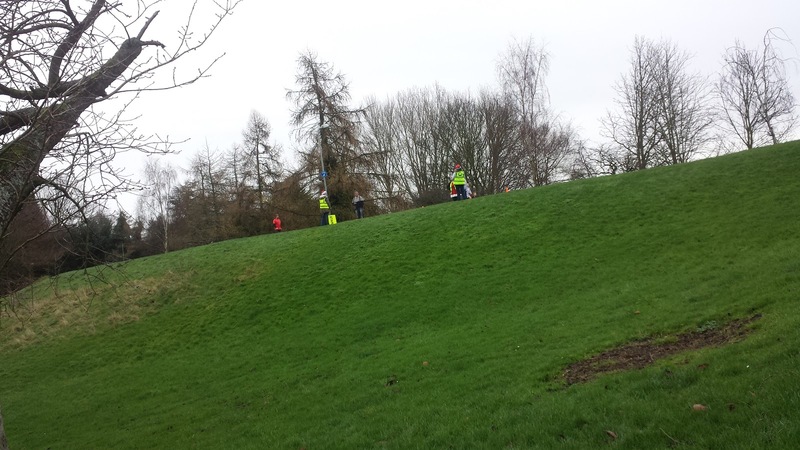 The first is a drop on a tarmac path just before reaching the longest section of grass which goes through the former pitch and putt area (which may be reinstated at some point in the future). In the winter this is where it could be a little soft underfoot and is the most challenging part of the lap. Not only because of the grass and mud, but because it heads gently uphill. The reason it felt so tough for me is that I had chosen to buggy run with my daughter and it was like pushing the buggy through treacle at points. The very last part of the large lap sees the runners running over a small bridge and then tackling a rollercoaster-esque down and up. At the end of lap one, the runners turn left and complete the large lap again. At the end of lap two the runners turn left and start the lap but will follow the signs for lap 3 that take them around the final smaller loop which re-joins the larger lap at the bridge. 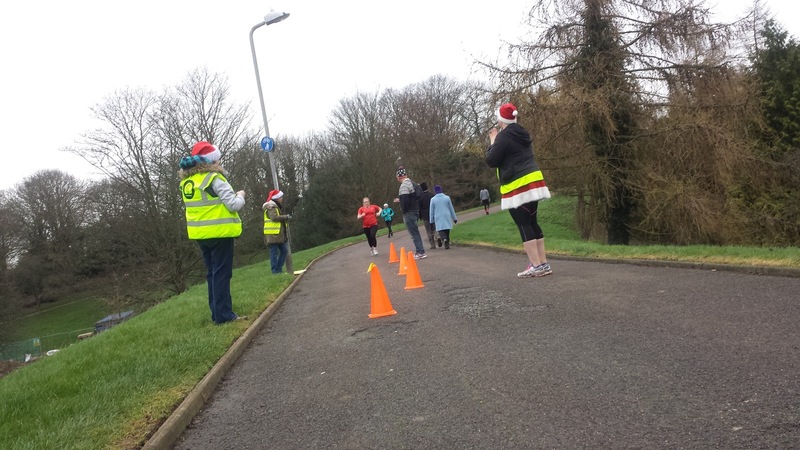 At the end of this smaller lap, the runners turn right and head downhill back to the start-finish area where the timers and barcode scanners will be waiting with a smile (and on the day I visited, a mince pie!). 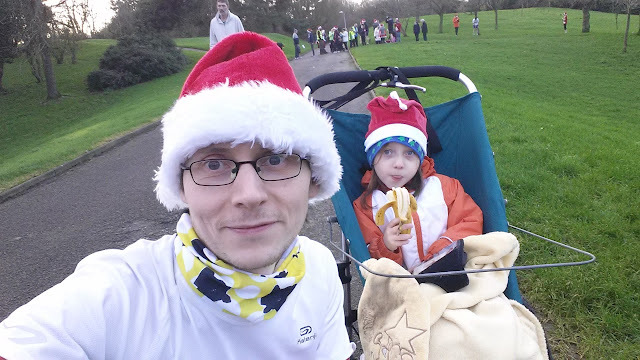 We ran at event number 61 and thoroughly enjoyed our time there. It has a nice variation of areas to run through and there are plenty of twists and turns and ups and downs so it never gets boring. My GPS readings from the course can be found on Strava (Harlow parkrun on Strava). If we had visited on a regular day we would have probably grabbed a coffee from the independent coffee van that serves the event, and we would have definitely have stayed and visited Pet's Corner. But as it was Christmas Day we thanked the volunteers and headed back home to see if Santa had dropped off any goodies! 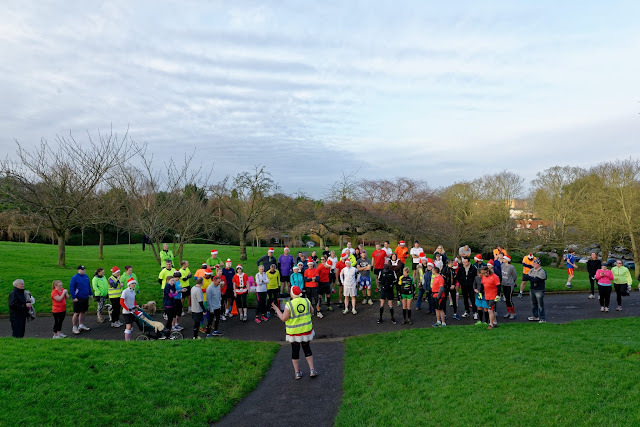 As a little personal note, this run marked the occasion of me having run at an official parkrun on all seven days of the week.